Removable underseat bookracks are a great way to add storage space for song books when not in use. These underseat bookracks will limit the stacking ablilty of the chairs. 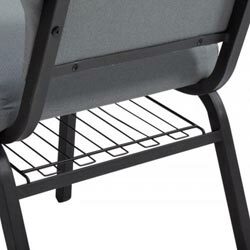 When in place, the book rack is only accessible from the rear and creates a 2" high gap between the surface of the rack and the underside of the seat.